Find Out your First Tweet on Twitter-6 Ways to Find! I’m a big fan of Twitter and addicted to it. If you are also like me, then your twitter profile may contain lot of tweets. Have you think or do you know what’s your first Tweet on Twitter? Mostly, your answer will be No. If you are having an eager to know about your first tweets on Twitter, then this post is for you. There are different ways to find our first Tweets on Twitter, I’m going to share all those ways in this post. By default Twitter is not providing any tips or any easy way to find our first tweets or old tweets on twitter. If your twitter account is new and having less tweets, then we can easily find first tweet by using “More” option provided by Twitter. But this “More” option don’t suits for older or large twitter profile. So I have collected different ways to Find First Tweet on twitter. Now Twitter is providing a better option to find your First Tweet on Twitter. To check your first tweet, just visit https://discover.twitter.com/first-tweet and enter your username. Now you accurately find your first tweet on twitter with the help of official twitter feature. To find your first tweet, follow the below steps. 2. 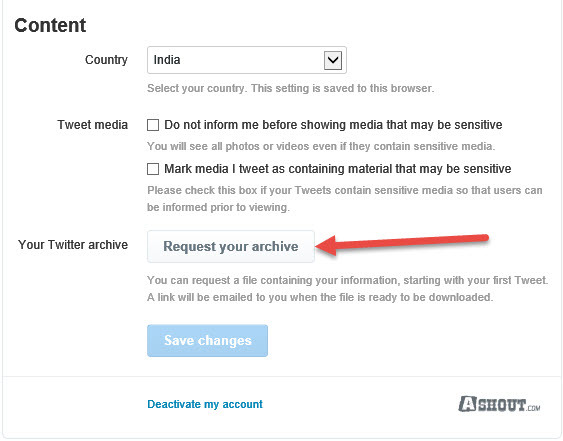 Scroll down to the bottom of the page, and click on Request your archive button to download all your Tweets. Which includes your Retweets as well. 3. Once you done that, check your email inbox to see mail from twitter (it will take some time). Here in this mail you’ll see the link to download all your tweets. To download click on Go now button or click on that below link. 4. Once you click on that link, it will take you to the twitter website. Here you’ll see Download button, click on that button to download all your tweets. 5. You’ll download Tweets folder. Extract that folder and open index.html file to see all your tweets. 6. 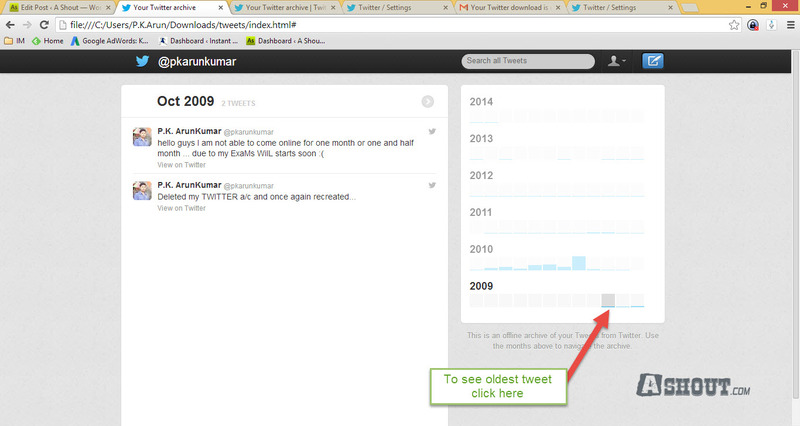 To see oldest or first tweet, select the Year and click on the small blue mark to see tweets on that month. That’s it. This is how we can easily find all our old tweets and Retweets. 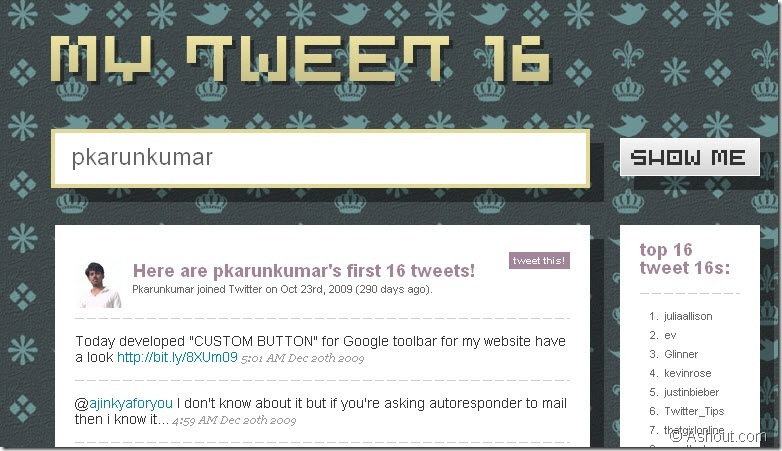 My Tweet 16 is a web apps which helps you to find out your “First 16 Tweets” on twitter. It’s really easy to use. Just enter your or any Twitter username in empty box and click SHOW ME button to show your first 16 tweets. 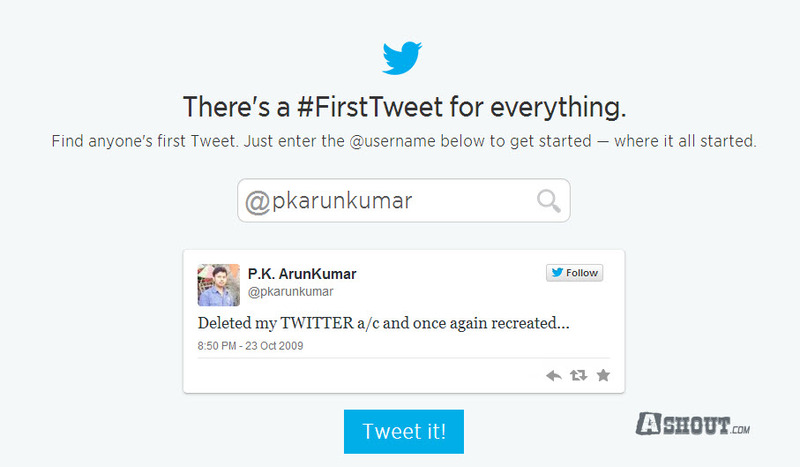 When I tested with my twitter handle (@pkarunkumar) it shows the result as shown below. I think this tool/way is the best when compared to other ways what I’m going to show here. My First Tweet is also free web apps which help in finding our first tweet. But it works quite different from My Tweet 16. Because, it shows only your first tweet and don’t display first few tweets as shown by MyTweet16 tool. 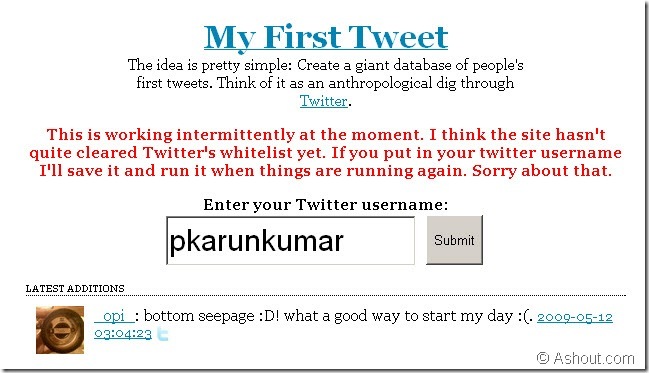 To find first tweet with “My First Tweet” tool, just put twitter username in empty box and click submit button. Within few minutes you will get a tweet @mentioning the result. It’s won’t display the result immediately as displayed in My Tweet 16. With the help of Twime Machine we can also find first tweets on our twitter account. But with this tool we cannot find other first tweets, because we need to sign-in with our twitter account. After sign-in you will see your latest tweets in that page, just scroll down the page you will see the option which is shown in the image. To find your first tweet or older tweet just click “Oldest tweets” or enter maximum page number in the empty field and click Go button. Now you will get your old tweets. I think these are the working tools to find out our first tweets on twitter. I find few others tools too, but those tools are not in a working condition anymore. The other method is the manual method to find out our first few tweets in twitter. This idea is taken from rickmahn site. When I tried all the above methods, the result is not same. And it varies- means no result is accurate. But you can find near to your oldest tweets. what about if you change your twitter name will you get the same results? I think it won’t work on that time..